Many myths have surrounded Freemasonry for almost as long as the brotherhood has existed. As a part of the organization, Masons teach their lessons through symbols and allegorical plays, but these myths are lies that are repeated through the generations that critics of Freemasonry continue to feed on even today. Many myths contain a kernel of truth that is expanded and exaggerated until it is no longer recognizable. Many of these types of myths surround George Washington and the Masons around the time of the Revolutionary War. Many scholars have studied these myths and have been able to refute many of them with hard facts. Since the founding of the United States, many of its leaders have been Freemasons. This truth has no doubt been the root of many myths surrounding some of the first leaders of this country. One popular myth is that all of George Washington’s generals during the War for American Independence were Freemasons. In truth, 33 of the generals were Masons, but this was not all of his generals, nor was membership in the brotherhood a requirement for serving under Washington. Another myth involving George Washington is that the Governors of all of the first 13 states were Freemasons. In fact, from Lexington to the inaguration of Washington as President, 30 different men served as governors, but only 10 were Masons. Another Early American myth is that all of the signers of the Constitution as well as the Declaration of Independence were Masons. Out of the 56 men who signed the Declaration of Independence, 9 were Masons; of the 39 men who signed the Constitution, 13 were Masons. These were impressive numbers, but most definitely not all of the signers in either case. A myth that sprung up in the 20th century is that of the Masonic image of the “All Seeing Eye” on the back of the $1 bill. This myth has appeared in popular entertainment in recent years, involving the “All Seeing Eye” floating over an unfinished pyramid that is commonly recognized as a Masonic symbol. The image of the eye in the triangle is actually part of the Great Seal that was designed by four men in 1776, only one of which, Ben Franklin, was a Mason. This image has actually appeared throughout the Renaissance as a symbol of God, long before the advent of Freemasonry. The designers of the Great Seal chose this image to float over an unfinished pyramid to represent God looking out over the new nation of the United States with 13 rows of stones representing the original 13 colonies. Sometimes the Masons themselves perpetuate myths as a joke on new members. 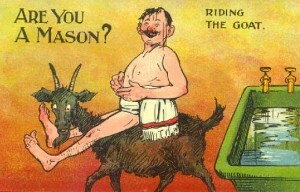 One of these is the myth that initiates must ride a goat in the Masonic Hall as part of the membership process. The goat has long been a symbol of the devil and witches were said to ride goats into towns, which was probably brought into play when Masonic detractors accused the brotherhood of practicing witchcraft in the Lodge. It didn’t help that early ritual books referred to the God of All Things, or G.O.A.T. This has since been changed to the Grand Architect of the Universe. While myths sometimes contain some truth at their core, the main purpose is to continue to spread misunderstanding about Freemasonry. When these myths are compared to the facts, it is easy to see how they can be exaggerated into interesting, if untrue, stories. Not everyone who was involved in the founding of the United States was a Mason, and with very few exceptions, there are no goats running loose in the Masonic Lodges.